Stir peanut butter into chocolate mixture. Spread 1-3/4 cups of the mixture into a greased 15x10x1-inch baking pan. Refrigerate until the mixture in the pan is set (about 20 minutes). Set the remaining mixture aside. Meanwhile, in a large saucepan, melt the butter or margarine. Stir in the evaporated milk and the vanilla pudding mix. Cook and stir over medium heat until thickened (mixture may appear curdled). Stir in maple flavoring and vanilla. Stir in the powdered sugar. Carefully spread the pudding mixture over cooled chocolate mixture in baking pan. 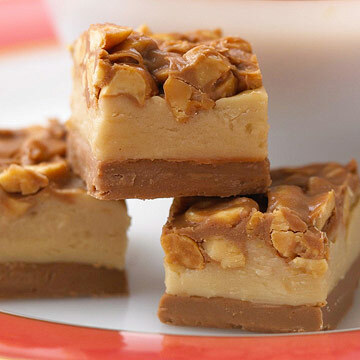 If necessary, reheat the remaining chocolate-peanut butter mixture to melt. Stir in the peanuts. Carefully spread the chocolate-peanut butter mixture over the pudding. Chill in the refrigerator to set. Cut the candy into squares. Makes about 6 pounds (sixty 1-1/2-inch squares). When you say regular pudding, do you mean instant or the cook kind? Hello! This is Hannah, Midwest Living's food editor. I believe that because it says "regular" pudding, the recipe is calling for the traditional cooked pudding mix, rather than the instant. Thanks! Could you sprinkle the top with either walnuts or pecans....not a lover of peanuts.